Nottingham Advisors believes strongly that an investor’s asset allocation is the most important factor in achieving one’s long-term investment goals. Nottingham utilizes an index-based approach using exchange-traded funds (ETF) as an investment vehicle to provide purity of style, liquidity, transparency, and diversification in a cost conscious way. An exchange-traded fund (ETF) is a basket of securities designed to track the performance of a particular market index. Nottingham believes this approach offers a unique solution that separates the firm approach from individual security selection as well as the traditional “manager of managers” model. Click each portfolio strategy to learn more. How much volatility are you as an investor willing to withstand? This becomes a very important component of investing when liquidity mandates are set. How long do you plan to be investing? This could be a defined year in the future or a significant life event (wedding, retirement). 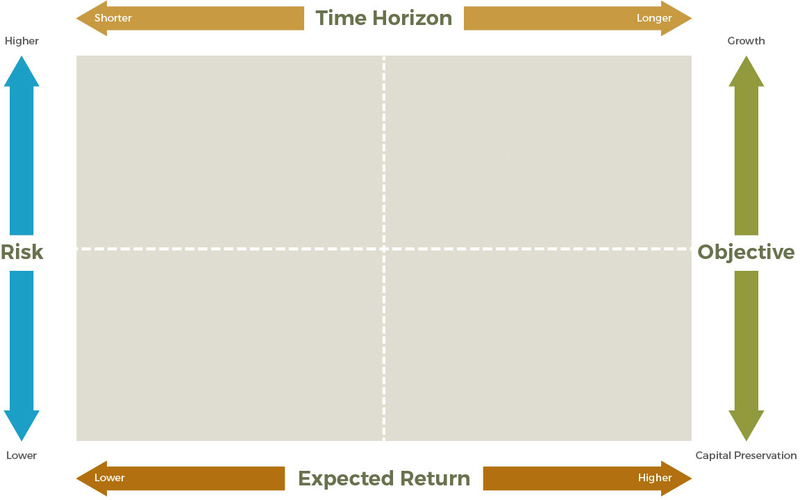 For institutional clients Time Horizon can be infinite. Return generally increases as risk increases, the basics of the Risk-Return tradeoff. Investment Objectives are strategies that an investor is willing to undertake to pursue their specific investment goals. The NA Real Return Strategy seeks to protect against inflation and monetary instability by producing long term returns consistent with its benchmark of CPI + 3%. NA Global Income Strategy seeks a high level of current income in the context of capital preservation, with added importance given to safety of principal. The Global Balanced Strategy seeks current income in the context of capital preservation, with secondary consideration given to growth of capital. The Global All-Asset Strategy seeks to balance growth of capital with current income. The Global Equity Strategy seeks growth of capital.